While SSL is a problem solver but very often it also runs into problems. Well! The problems that your SSL Certificate runs into can be easily avoided or corrected. It is always better to have an SSL that sometimes runs into problem instead of not having SSL Certificate installed and getting the data hacked or accessed by un-authorized personnel. One problem that commonly occurs with SSL Certificates is name mismatch. A name mismatch error can be explained as the situation where the name of domain doesn’t match with the value on SAN. Why resolving common name mismatch error is important? A website simply cannot function without an SSL Certificate working properly. The browser will either restrict the entry to the site or warn the users about the “harmful site ahead”. Both the situations are not a good thing for an online business. Getting the common name mismatch error resolve is the only option left for the online sites. What may be the reason behind such errors? This probably is the most common reason behind the SSL Common Name Mismatch Error. This generally happens when you forget to add “WWW” while adding your site’s URL when applying for SSL certificate. It can be resolved by requesting an upgradation. Resolve: Missing www can lead to big problems in the future. One needs to get an SSL certificate re-issued to get rid of this error. Name mismatch error is quite conspicuous and important to resolve, you can process without resolving this innocuous error. There are times when the certificate is not installed in the best way possible. These errors can occur due to slow internet connection or problems with the web hosting. In case the hosting is facing downtime, such errors can occur. Resolve: Try reinstalling it again when the Internet is fast and the web hosting is up. You can check for the error here. When SSL certificates are installed on dynamic IP addresses, which keep changing every time you access a site then common name mismatch error will occur. Resolve: Getting a SSL Certificate installed on a Static IP address can solve the problem and stir the website in an error free direction. These are small things that need to be checked while installing an SSL Certificate because these certificates are bound to secure the data and if they only keep running into problem then there’s going to be bigger security lapses in future. Well! People generally access a site by typing the web address in URL bar but web developers and web masters sometimes try to access the site using the IP Address. A site is accessed by IP either when it is under maintenance or some new features are being added. Resolution: One needs to access the site by host name or URL and not by IP address. Specify host name can also resolve the problem. 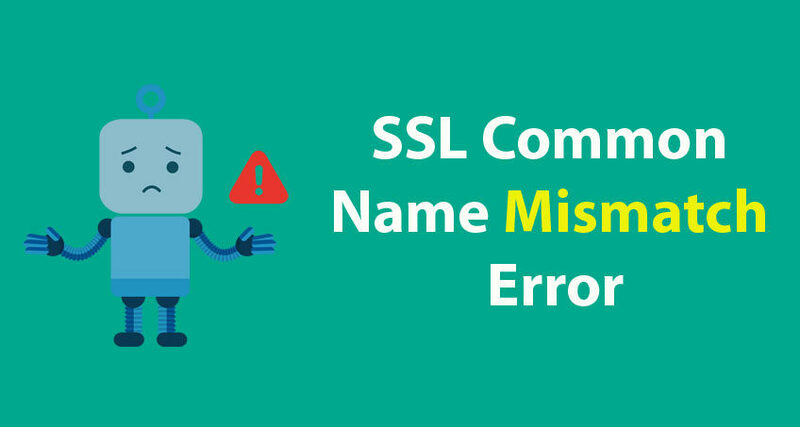 This is a very common reason leading to common name mismatch error; the web hosting provider generally has a set of rules and parameters they use for everything, which sometimes doesn’t match with the SSL certificates. Resolution: Check your site through an SSL Checker tool and find whether the host name is specified or not. By specifying the web hosting name, you can resolve the problem within minutes. Resolution: Simply make a change in the Domain Name Server and the problem will be resolved. By making changes in Domain Name Server you are allowing the new SSL Certificate to get installed in a new IP Address. Domain Name Server was recently updated/changed! Yes! Resolution can sometimes be the reason a problem arises. Untimely change in domain name server can lead to such common mismatch error but the resolution to this problem is quite simple. Resolution: Sometimes waiting can resolve the problem on its own. DNS are corrected very often on their own. If the problem persists for more than 24 hours, it is advised to get in touch with the Web hosting provider and seek a resolution. It has become impossible to run an online business without having the requisite SSL certificates providing the optimum security. With your SSL Certificates malfunctioning or having issues can lead to a bad name for your business. Do not lose a lot of business and opportunities just because your SSL Certificates show a common mismatch error. Follow the resolutions provided in this article and get all your woes related to SSL Certificates resolved. The resolutions listed in this article cater to the varied reasons Common Name Mismatch errors.